An interesting combination in the spirit of a bruised apple or a snakebite, this one combines strawberry ale with Guinness stout. These two beers resist mixing strongly, so you tend to get mostly Guinness on top and strawberry ale on the bottom. 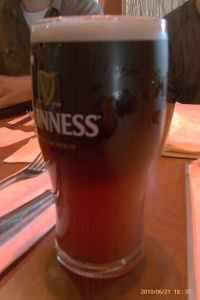 However, you do get some flavor diffusion, so there was a hint of fruit in the Guinness. It was less sweet than I expected, but then again strawberries have very little sugar in them. Not terrible, and not great. I am not sad I tried it, but I don't know that I would ever order another one. It might actually taste better if you just mixed it real thoroughly. That seemed wrong though. The Früli just isn't good enough on its own to really make this a good combination. The strawberry ale is fruity and earthy, but it has a bit of a sour finish that clashed with the smooth malt of the Guinness.